Editor's note: This story has been updated since its original publish date on Oct. 6, 2016. CINCINNATI -- Colin Kaepernick's national anthem protest started quietly. The first two times Kaepernick sat for "The Star-Spangled Banner," no one noticed. It's understandable. He was an injured back-up quarterback and the anthem was being played before an NFL preseason game, which means few people were watching. The protest, of course, eventually caught fire and spread. And after President Donald Trump's comments Saturday calling for the firing of every "son of a b----h" who "disrespects our flag," it became a national issue. Trump's comments incited a mass increase in such activism Sunday, with more than 100 NFL players sitting or kneeling , others raising their fists and whole teams standing with locked arms to display unity. “Football and politics don't mix easily. Fans come to NFL games to watch great competition on the playing field and that's where our focus should be." But back in the team's infancy, the organization brought in a player whose anthem protest did everything Kaepernick's didn't. It immediately shocked the world -- literally, not in the sports cliche way. 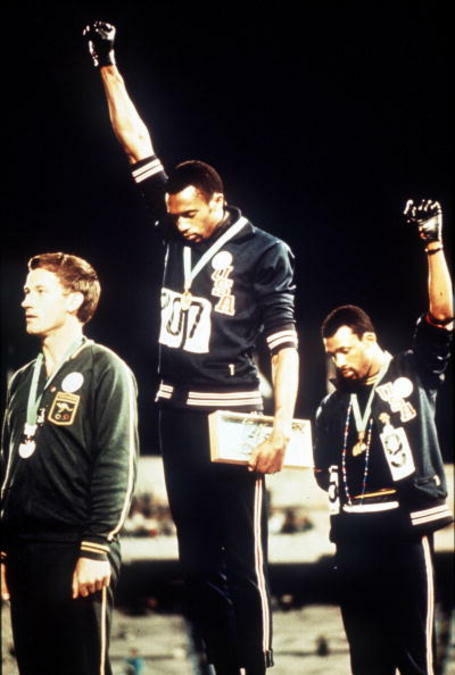 During the Summer Olympics in Mexico City in 1968, a period of great racial strife in the U.S., Tommie Smith and John Carlos bowed their heads and raised black-gloved fists as the national anthem played after they won gold and bronze in the 200 meters. That was in the days of only three networks. Most of America was watching. There was instant outrage. Smith and Carlos were dismissed from the team and sent home. One year later, Smith was a Bengal, trying to make the club as a wide receiver. Paul Brown, the man who invented pro football, a conservative, no-nonsense type if there ever was one, brought in one of the most controversial athletes of the time. I was shocked by how little coverage it got locally. A lot of that has to do with the era. There was no ESPN. No sports talk. The local papers did a single news story about Smith's signing on the sports page, not the front page. There was no comment from Brown or anyone from the Bengals organization on what had happened in Mexico City. PB's quote in the Enquirer story: "He's been contacted by a lot of teams. One thing is certain -- he's fast enough." True. Smith was the first man to break 20 seconds in the 200. The world record of 19.83 he set in Mexico City stood for 11 years. He also ran 10.1 for 100 meters. And he was big -- 6-foot-3, 190 pounds. Smith had been a ninth-round pick by the Los Angeles Rams in the 1966 draft. He was cut during camp. Still, it seems odd now that the Bengals would bring that kind of attention on the organization. Smith concentrated on track at San Jose State. He hadn't played football since high school, so he was no sure bet. But Bob Hayes had gone from Olympic champion to NFL star receiver. That's probably what intrigued PB. Mike Brown, Paul's son and current team president, declined to talk about the story. Smith did not return a phone message. Smith, at the time, tried to avoid talking about what had happened in Mexico City. "I don't want to talk about that now," he told reporters upon reporting to Cincinnati. "I'm in Cincinnati to try to make the Bengals travel squad. I can't even think about or go deep into that." Smith had signed with the Bengals because they offered $500 more than the Oakland Raiders, and Saint Saffold, Smith's roommate at San Jose State, had played for the Bengals in 1968 and vouched for PB. "He told me all about Coach Brown," Smith told reporters midway through the 1969 camp. "He told me, 'He's a fair man. If he says he'll do something, he'll do it.' Since I've been here, he's been wonderful." Paul Brown barely addressed the political part of the story. He had been one of the first coaches to bring in African-American players in the early days of pro football. Racial equality was an important part of the way he ran his franchise. "It has to be that way," he told a Dayton Daily News reporter. "We don't want our football players to ever have to think about that. This is life at its best from that standpoint." "I'm a citizen of this country who happens to be black and regardless of my skin color, I wore red, white and blue in Mexico and represented all America. "I'm proud to be an American, yet I firmly believe we have problems that must be met. I've been misquoted and misunderstood numerous times by those who had to have a story and refused to see the truth." Smith spent three years with the Bengals, mostly on the old Taxi Squad. Smith was one of the fastest men alive, but he was a long strider. "It takes me six or seven strides to get going," he said. That didn't translate well to football. He played two games in his time with the Bengals, catching one pass for 41 yards. As the political climate changed in the country, Smith's gesture was looked at differently. He and Carlos are looked at as important figures in the Civil Rights Movement. "We were not Antichrists. We were just human beings who saw a need to bring attention to the inequality in our country. I don't like the idea of people looking at it as negative. There was nothing but a raised fist in the air and a bowed head, acknowledging the American flag -- not symbolizing a hatred for it." Smith recently told Maclean's magazine that he supports Kaepernick. "I'm 72 now," Smith said. "You've got two people here that are fighting for the same thing, a half a century apart."